PHOENIX (July 20, 2009) — The fact that readers of Meetings & Convention magazine have awarded the 2009 Gold Service Award to the Greater Phoenix Convention & Visitors Bureau is not shocking news. After all, the Greater Phoenix CVB has earned the award 23 times. What’s notable for 2009 is that the Greater Phoenix CVB’s Convention Services staff maintained its level of excellence while assisting more meeting attendees than ever in the newly expanded Phoenix Convention Center. Nearly 200,000 attendees have convened at the convention center since January 2009, when the facility welcomed its first groups following a $600 million expansion that tripled its meeting and exhibit space. M&C’s readers made the magazine’s 2009 Gold Service selections based on criteria that included professionalism of staff, support on hotels and site inspections, assistance with ground-transportation planning, guidance on local attractions, and liaison with local venders and services. Readers voted for the top CVBs throughout North America, and the Greater Phoenix CVB was rated among the best for the 19th consecutive time. 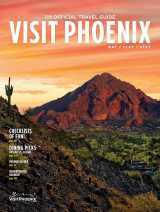 The Greater Phoenix CVB and other winners will be featured in M&C’s special “Gold Awards” issue in November.